Holds TVs up to 25". center opening holds VCR/DVD player. Generous lower storage area includes shelf and large drawer. Measures 28"W x 19"H x 19-1/2"D. Order hardware parts separately below. 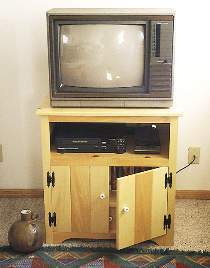 TV/VCR Stand Hardware Parts Includes two pair of hinges, ceramic knobs and magnetic catches. Project plan, wood and wood finish are not included.